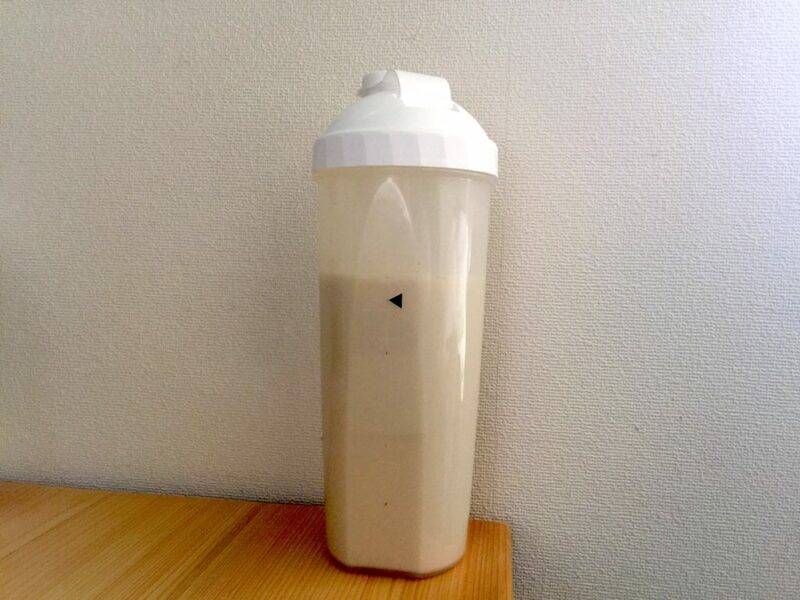 I’ve heard about Soylent before, but since it only delivers to the US and Canada, I have never ventured far enough to entertain the thought of trying it for real. It was until I started working in a tech startup, where the engineers in my company would often skip meals in favor of meal replacement powder, in order to maximise their time at work. That was when I first heard of Comp. What is this powder you speak of? For those of you who are new to meal replacement powders, these are bags of powder you mix with water to produce a shake that is meant to replace your meals. It contains all the calories and the recommended nutrition you need in a meal so you don’t have to spend time for an actual meal. They are usually cheaper than the average meal too. The first and most famous in the game was Soylent. Comp is the Japanese version. I marked the bottle wrongly because the measurements and instructions from Comp was hard to understand. It was only after some time that I decided to order it. I was coming to the office about three times a week, and lunches around my office, like this Ramen with Whipped Cream was a joy, but I wondered how much money I could save if I used Comp. After some calculations, I decided to go for the trial pack, which was just ¥300 for 3 packs (400kcal each). Including a ¥500 for delivery, the nett cost was ¥266 per pack. Note that this does not equal to one meal. Based on Comp’s recommendation taking into account my age and activity level, my required calories was 770 kcal per meal. But because they came in such convenient one-use packets, I decided to go on a little diet and just settle with 400 kcal per meal for the period of the trial. After the trial, I went for a subscription of 2 large packs (about 5.2 meals per pack) every 2 months. You can cancel anytime, even after the first delivery and still retain the subscription savings. First of all, the measurements are tricky. Using grams, ml and kcals all over the place, its hard to figure out exactly how much powder you need and how much water to add. The best way I found was the use the calculator on their site and if it says 420ml per meal, fill the shaker bottle with powder to the 420ml marking. Since they markings were in increments of 100ml, I marked the spot where I needed to fill my powder to. Given the size of the bottle, I usually just top water to the brim and shake it. If any powder gets stuck to the bottom or won’t dissolve no matter how much I shake it, then I would add more water. I usually need to add more water to get it completely smooth. The website did recommend to have water in the shaker before you add the powder to help it mix better. I liked filling up my shaker with powder and bringing it to work, so the recommended method was not good for me. But if you shake hard and long enough, it will eventually be smooth. I marked the bottle for one meal of powder. The solution takes time to dissolve, so even if you fill water to the brim, the shake will end up around this level. This tasted better than I expected. It tasted like a mix of sweetened soymilk and oats. After my first bag, I thought I could totally go long-term on it. There are articles on people mixing orange juice, flavored water and coffee with it, but I decided I didn’t want to spoil my tastebuds and kept to water so far. But what I did start doing after awhile was to shake it a few hours before consumption and refrigerate it, which made it taste better to me. The ratio of water to mix is a little tricky. Add too much and it tastes bland, mix too little the powder gets hard to dissolve. For me, I follow the recommended 200 ml of water for every 400 ml of powder. This gives you a thick flavor that makes you feel like you actually had solid food. It was also filling like a normal-portioned meal but I do feel a little hungry toward dinner time. 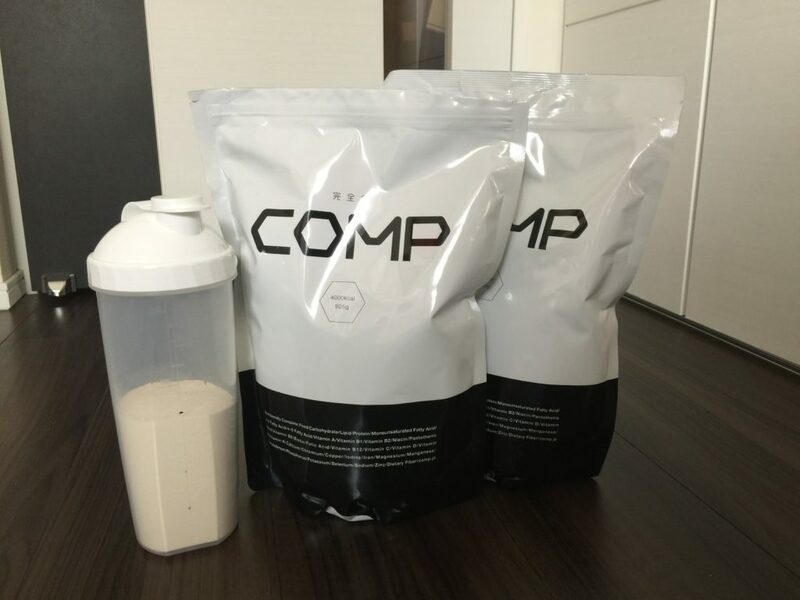 While I am sure I can use it for long, I am not quite sure I can replace all my meals with just Comp. Japanese food is too hard to give up. What really does it for me is that this saves time. But this isn’t unique to Comp, any meal replacement powder will help you save time. This also saves money. After the trial, I went for a once every two months scheduled delivery of 2 bags of Comp. By my calculations, each meal of 770 kcals will come down to approximately ¥640, a small saving from the average amount spent for lunch of ¥777. Not too relevant, but I also like the monotone and simple branding of Comp. The whole mixing process is messy, especially if you try to top up water in between shakes. The mix will get all over the place if you aren’t careful uncapping it. But that said, it is certainly less messy than slurping a bowl of ramen. Also, you have to wash the bottle between each use. Once again, these are probably not unique to Comp. The measurements and instructions were confusing. The use of grams and ml at different places makes it unclear the exact amount of powder you need. As a reference, most other brands say clearly how many meals you get per pack or how many scoops or exactly which marker on the bottle you should fill it up to. While this means that you won’t get exactly what you need or want, it takes out the hassle of getting the amount of powder right. But then again, after the first time, you can make a marking like I did and there won’t be much problem. So, this wasn’t such a big deal for me. I only started price comparison after my first order, but soon realise Comp is relatively expensive if you consider the global market. Even at the lowest price of ¥594 per meal if you buy 8 packs (40 meals) on a subscription (based on a 770 kcal/meal calculation), there are a lot cheaper options even though Comp is the only one located in Japan offering meal replacement powder. However, most Japanese won’t venture out their comfort zone to a non-Japanese service, which is why you would have an advantage when making your choice. The cheapest I found was Jimmy Joy, where if you order 30 bags (90 meals) and include the shipping cost to Japan, a meal would cost you an insane nett ¥319 based on their recommended intake of 694 kcals (or ¥354 is you use 770 kcals like Comp). So base on if you order the highest quantity offered from both Comp and Jimmy Joy, you save ¥240 per meal if you go with Jimmy Joy. I plan to try it next and will be sure to write a full review then. Comp is great if you live in Japan and want something convenient to order. But if you want the best price try Jimmy Joy. If you want something more organic that ships to Japan, try Bertrand for a marginal price increase.